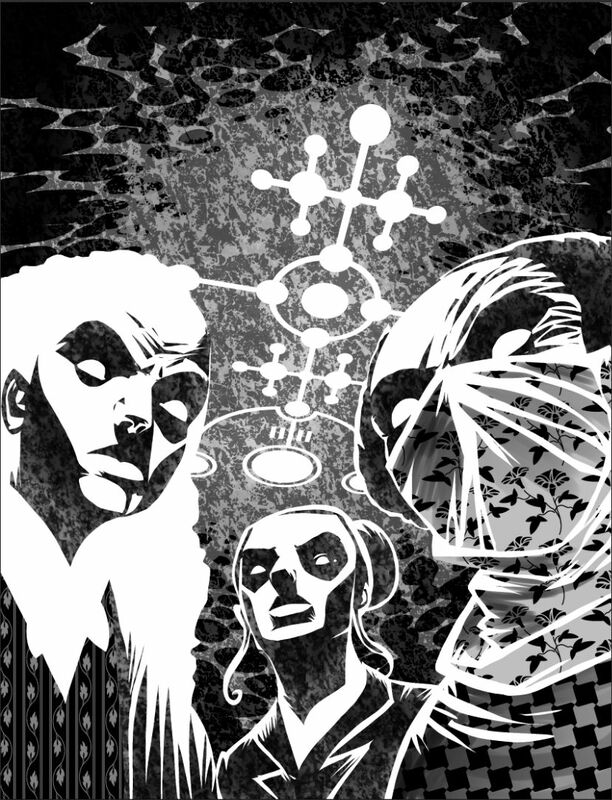 2000AD Covers Uncovered: D'Israeli - D'Sisters of D'Eath! 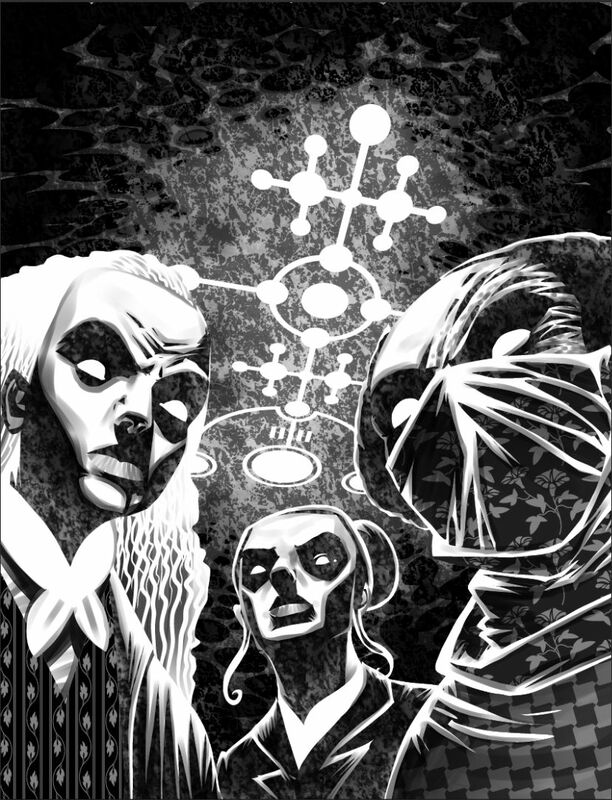 Fan favourite D'Emon D'raftsman D'Israeli is back with this haunting cover depicting three wicked witches that would gladly see the destruction of our world. Powerful stuff indeed, just in time for Halloween! 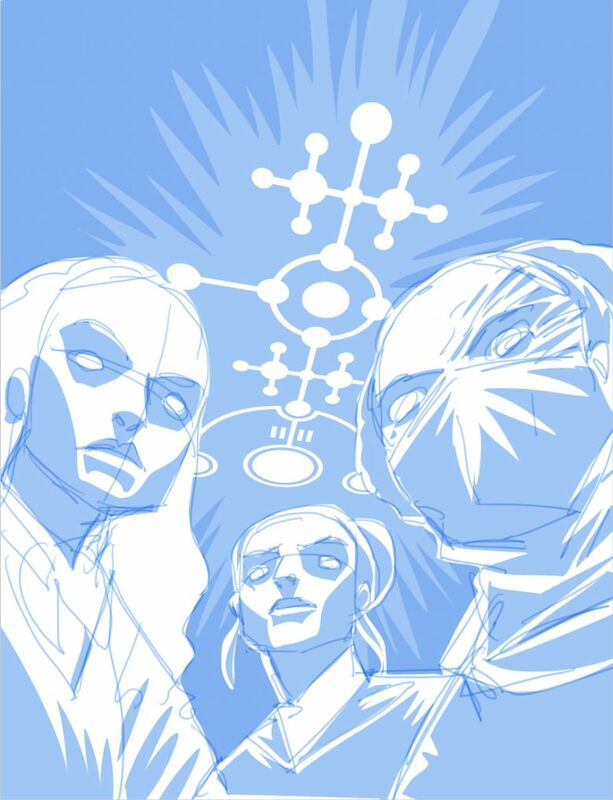 As ever, Mr D'Israeli has given a gloriously detailed breakdown of his cover process, so as Stickleback himself would say, "Off we trot playmates, arseholes and elbows!" 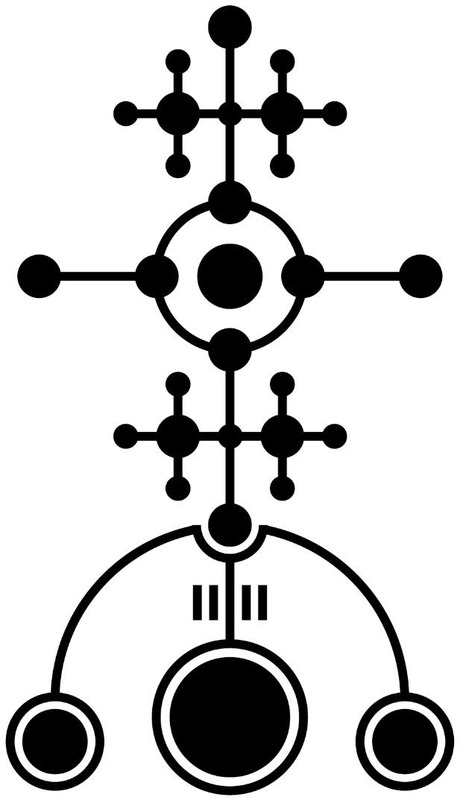 “The symbol” is a crop-circle-type sigil that’s a major element in the story and appears multiple times in the strip itself. I constructed it in the vector program Adobe Illustrator (which is really good for making geometric designs like this) and exported as a high-resolution bitmap (TIFF) file that could then be imported into Manga Studio." 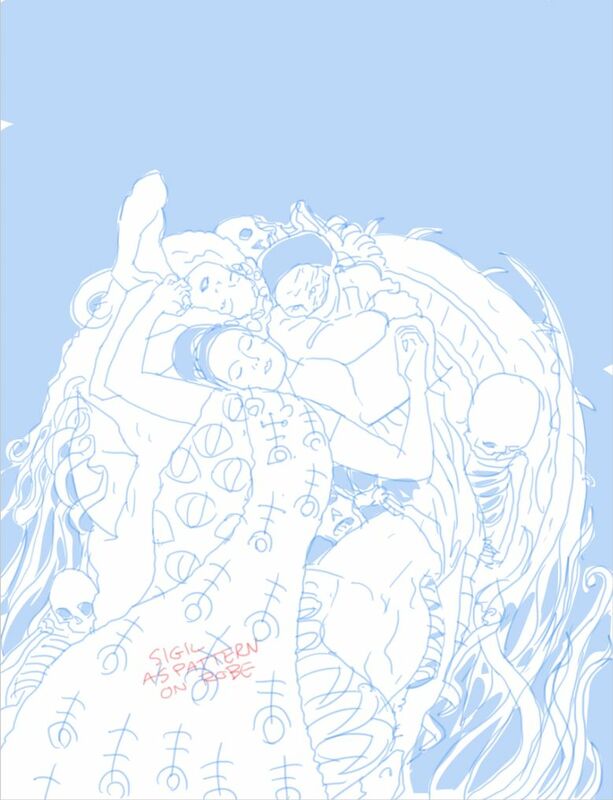 "I used Manga Studio 5 to generate the three roughs which I submitted to Matt Smith. 01 was the closest to the brief, 02 added past and present versions of Black Bob (as seen in that episode), and 03 was a “wild card” design based on a Gustav Klimt painting. Matt Smith went for 01. 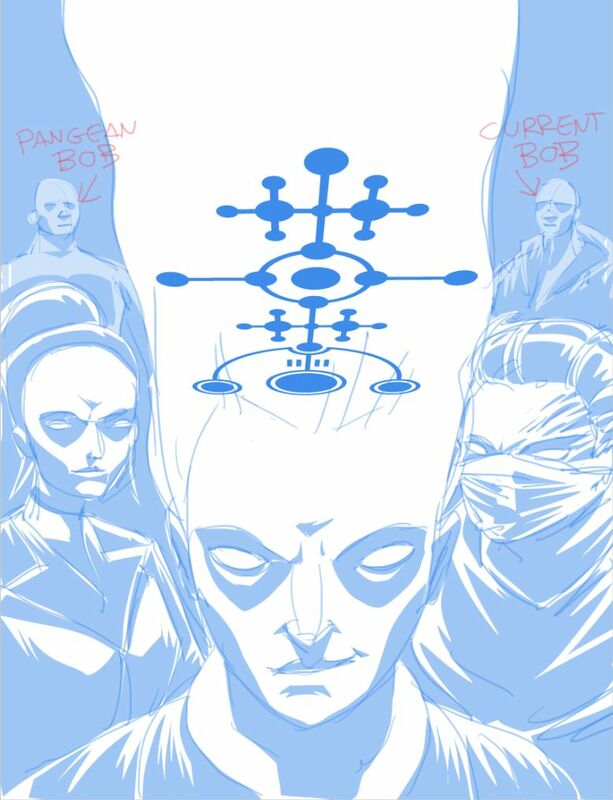 In the case of 01 and 02, I imported the symbol into Manga Studio and used the transform setting to distort it into the correct perspective, as that was quicker, easier and more accurate than trying to draw the symbol by hand, even roughly." "Look out! Falling crop circles!" Penny Red had spent a long time training her famous synchronised head lice team. 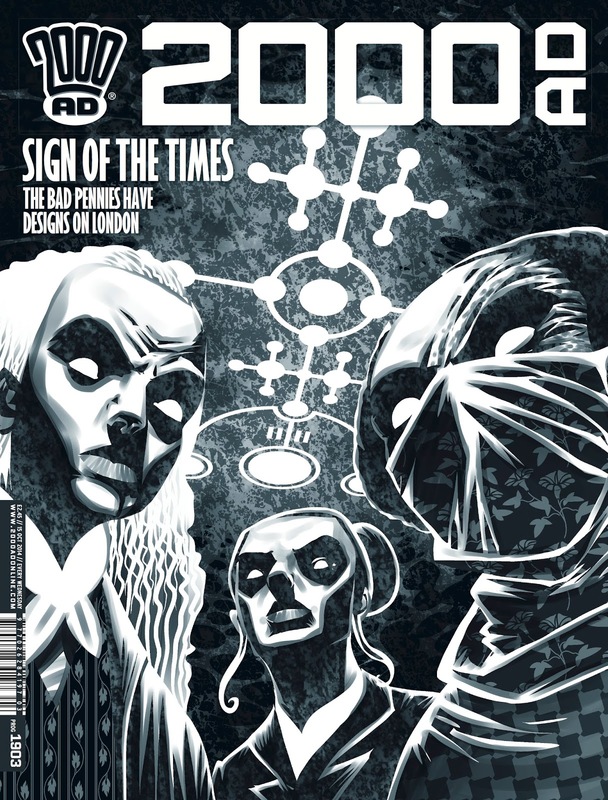 Bah, I really, really like this one Tharg! "Next the grey “pencil” drawing over the top of the chosen rough. I still think of them as “pencils” even though I do the whole shebang digitally. 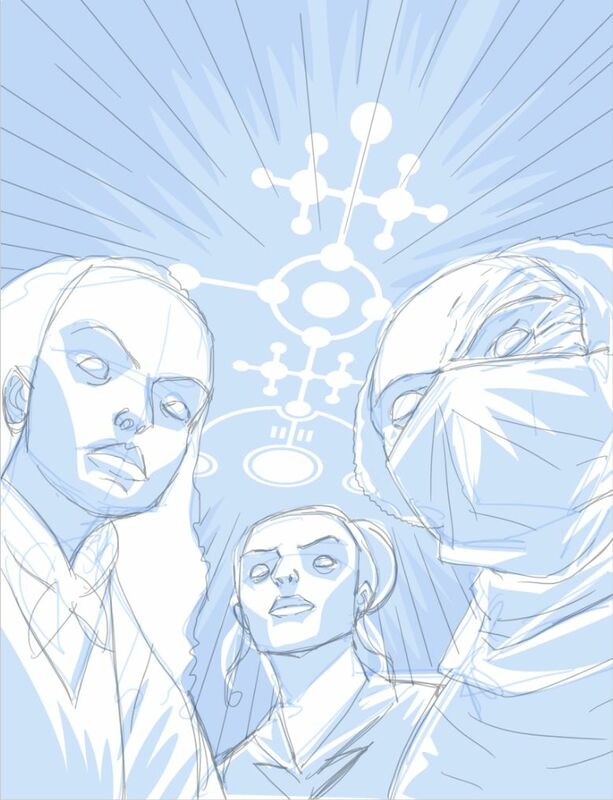 As ever, I do the “pencils” on a separate layer so they can be changed without affecting the underlying drawing." "Next the blocking. This breaks the drawing up into blocks of colour that I can select later and fill with texture. Since I did the last series of Stickleback, I discovered Manga Studio 5’s incredibly useful “Lasso Fill” tool, which for some silly reason is hidden away in a sub-menu. Lasso Fill allows you to draw a shape freehand, but instead of producing a selection, it automatically fills the just-drawn shape with your chosen colour as soon as you raise the stylus from the tablet (pro tip: Manga Studio lets you select “nothing” as a colour, and if you do that with the Lasso Fill tool it becomes a very quick and accurate eraser for large areas). The Lass Fill tool speeds up the blocking stage immeasurably, and acts in very much the same way as Illustrator’s Pencil tool did, back when I was using that program for drawing." 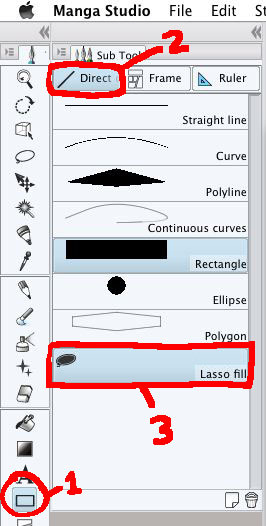 "Here's how to find the Lasso Tool in Manga Studio 5 (5 or EX5 but not earlier versions); there are a whole nest of sub tools hidden in the tool bar. Depending what sub-tool is selected, the icon will look different (to further complicate things, I’ve rearranged my toolbar, but try just below or above the Type Tool (A) on the toolbar (marked 1 in the illustration). A sub-menu will appear, divided into tabs. Click on the “Direct Draw” section (marked 2 in the illustration) and then on the Lasso Fill button (marked 3 in the illustration)." 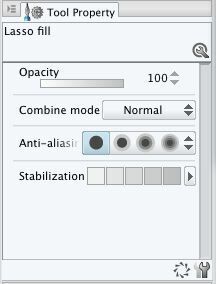 "My preferred settings for the Lasso Fill tool. If you’re working at resolutions below 400dpi, try playing with the anti-aliasing settings to avoid getting jagged edges." "At this point in the process, I export the cover to Photoshop format and open it in Photoshop (I use Photoshop CC but any version will do.) I add textures to the blocks of colour I’ve made previously (you can see a brilliant video tutorial of that here - Pete) I also put blocks of grey under the textures to make them more coherent and solid." "I then select all the textures (Select: Load Selection: pick “(name of layer) transparency” from the drop-down list and click OK) and, on a new layer, paint in blacks over the textures to deepen some of them further." You can see D'Israeli's incredibly useful video on this part of the process here." "I then close the file and re-open it in Manga Studio 5." This years' trick or treaters were scarier than last years'! "Finally, painting; I used to use Corel Painter for this stage of the process, but Manga Studio 5’s Watercolour Brushes are 90% as good as Painter’s, and Manga Studio is so much faster and more stable (in fact, Manga Studio runs faster with five pages open than Corel Painter can with one.) The upshot of this is that, after three upgrades which have actually brought declines in performance, I have with great relief been able to drop Corel Painter as a working tool." "That bit of relationship-breakup schadenfreude over with, back to business*; I use the Transparent Watercolour brush in Manga Studio 5 to add bits of shading and modelling to the faces, I also paint in dark areas on Penny Red’s long hair (left) and then scribble over them with a Pen Tool loaded with white to create hair strands." 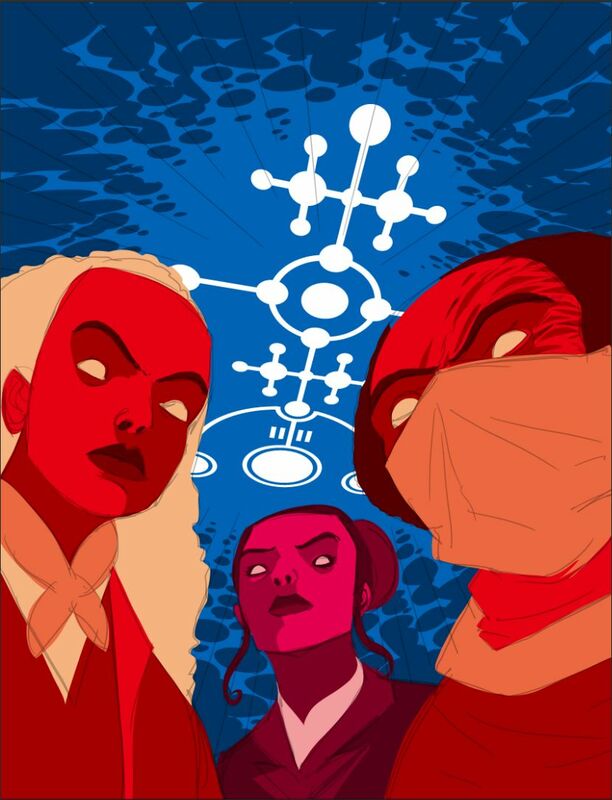 "Once this stage is complete, I close the file and re-open it in Photoshop and make a copy as a flat TIFF file for upload to the 2000AD FTP server. And that’s that!" And here's how those harpies look on your newsstand, yikes! Great galloping thanks to Mr Brooker for another amazing cover breakdown, check out his stunning blog right here! I love Mr Brookers cover breakdowns. I always learn something from them. Guys a bloomin' genius!